Out of Place #1 – A mythical mystery bus tour to a secret deep South West location, for a long afternoon and evening in the company of cult Westcountry collective Hacker Farm. Expect out-in-the-wild performance, installations, film screenings, electronic campfire communion and the radical rattle & splutter of repurposed junkyard goods – all harvested over a unique rural-industrial site. 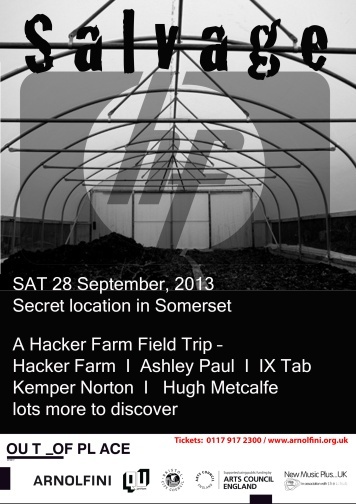 A site-specific interactive event that will find a Bristol-based audience travelling by bus for an afternoon and evening inspired by Hacker Farm‘s maverick DIY approach to instrument-building and composition, in the richly atmospheric surrounds of a semi-derelict agricultural site. Live acts include the homespun culture-jacking sonic experiments of Hacker Farm themselves alongside close collaborators including IX Tab and Kemper Norton, plus very special guests from further beyond including beguiling New York sound voyager Ashley Paul and films/performance from singular and seminal cross-discipline UK artist Hugh Metcalfe.